...Allie's back, tell a friend...Hey y'all! I am so happy to be back in blogland again. Like I mentioned in my last post I really needed to take a break from it to focus on some things my family is going through. Isnt it so true that when it rains it pours? Well at least that's how it felt for us in June. We had some things we were going through, some medical and others just personal. Two close family members had some health issues. But things are looking better now so that's good. I am so excited to get back to work on the house and catch up on reading my favorite DIY blogs! 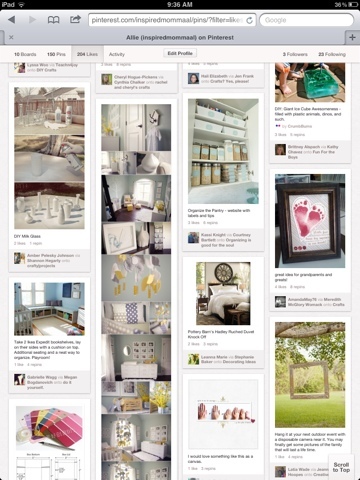 I've already reinstated my love for pinterest. I've had a little time on my hands this weekend. On Friday I was rushing to get the house picked up so some repair guys could come fix our a/c, and I cut my foot really bad. A broom without the top plastic part fell on the floor. And I was carrying some things to my kids room in a hurry and didn't see the broom on floor. And my pinky toe got caught in the top part and cut it really bad. I had to go to ER it was that bad. (Side note: I get hurt in the weirdest ways, who else gets cut by a broom handle?!) The doctor said she wishes she could put stitches in it but the cut was in such a weird spot it would pull my toe down weird. So I'm having to let it just heal. And it's on the bottom of my foot so I was told not to walk on it. GREAT! *insert sarcasm there*. So yeah I'm stuck in bed or just off my foot. I'm even in bed writing this on my iPad right now. But on the bright side I get lots of time to catch up on reading blogs and pinterest, so it's all good! Plus I have an awesome husband who is taking really good care of me. So I am one happy momma right now. And I'm super glad to be back! Sorry to hear about the foot but glad you are back!